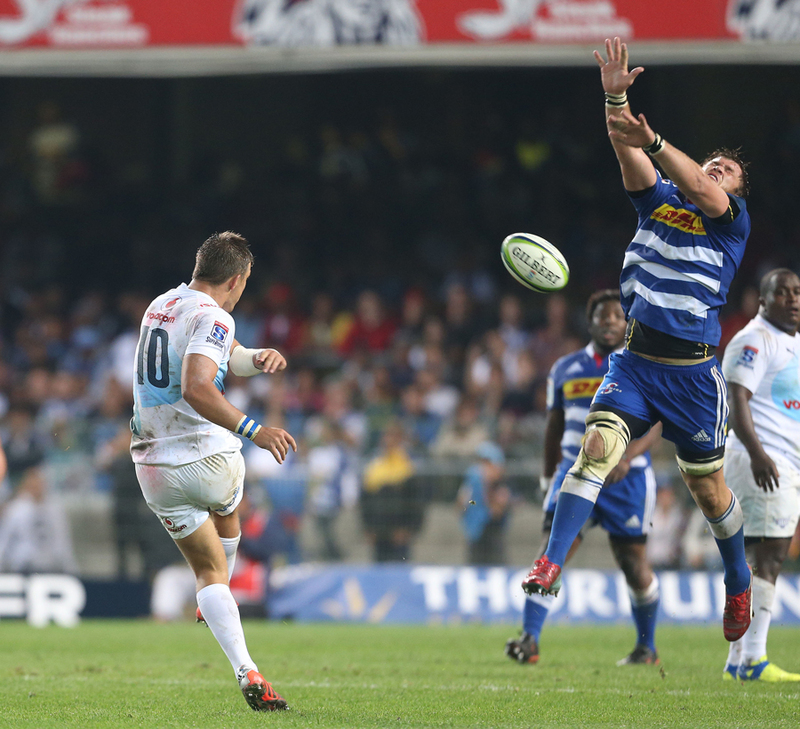 The average person would have had neither the time nor the co-ordination to take their eyes off the action and reach for a drink or release their breath to gulp down said liquid when Handre Pollard planned, lined up and attempted the drop goal that would have won the Bulls their match against the Stormers last Saturday. Duane Vermeulen had both and then some. He saw Piet van Zyl tell Pollard the goal was on, then heard the Bulls scrum-half stop Pollard from his first shot, then sensed Pollard was going to try again, and then charged down and stopped the fly-half when he did. In less than the time most of us to do something as simple as take a sip of something cold, Vermeulen won his team a match and sent them to the top of the South African Super Rugby conference. "That just sums up the type of player that he is. He is a guy who will play right to the end," former Springboks captain Gary Teichmann told ESPN. Teichmann, who now runs a construction company and plant hire focused on building in Africa, had not watched the match or read about it, but he did not react with any surprise to hear about Vermeulen's heroics. After the progression Teichmann saw Vermeulen make last season, it was almost as though he expected something like his. "Last year Duane became what I would call one of the best No.8s in the world, along with maybe Kieran Read," Teichmann said. "He always had the physical side of his game but last year he also worked on the ability to offload a little pass and a create opportunity and become an all-round kind of player." "The Bloemfontein factor disorientates many teams, but not the Stormers"
Vermeulen was named the 2014 South African Rugby Union Player of the Year, the Players' Player of the Year and the Super Rugby Player of the Year at a ceremony in January, after a season in which Vermeulen was also nominated for the IRB Player of the Year award. Vermeulen had been a standout domestic player since the 2010 season, when he was part of the Stormers side that reached the Super Rugby finals, and a Springboks player since 2012; but he evolved through the 2014 season into the kind of player that is heartbeat of a team. Vermeulen had always been a strong tackler, but in 2014 he seemed to become stronger as he averaged more than seven successful tackles a game. He also become reliable in the lineout and stole the opposition ball almost a third of the time while managing to run around eight kilometres a game. 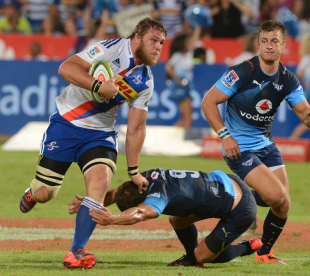 Teichmann described Vermeulen as having showed "improvement in his all-round game," and credited an improved Stormers front row with that development. "Duane has always enjoyed the physical side of his game but we also saw another side of him. He was able to offload little passes and create opportunities. It probably helps that down in the Cape, the tight five has improved as well so now they have the real grunt of a pack and that has allowed them to play both sides of the game." The Stormers did not have the results to show for it last season, when they finished behind the Sharks and the Bulls in third place on the South African conference and 11th overall, but their stocks are rising this year. Man for man, they are often regarded better off than many of their local counterparts and much better off eighth man for eighth man. In a recent comparison in The Cape Times (which may have had a slight bias given their location), ahead of the clash against the Bulls, Vermeulen was compared with Pierre Spies and came out on top in every department. Vermeulen was described as someone who "loves the physical exchanges more than a Karoo lamb chop," while Spies as said to be someone who "disappears like a cloud in the Kalahari when the going gets tough". The writer, John Goliath, was equally colourful about their contrasting attacking abilities where Spies matches up better but Vermeulen still wins out, needing an "army to get him to ground". The Cape media are not alone in rating Vermeulen so highly against his contemporaries, as Teichmann explained. "You get two types of players - those that are consistently good and give 100% and those who are game-breakers that might go missing sometimes but when they turn up, they are crucial," Teichmann said. "Duane is the first kind. You know what you will get with him. Always that something extra." Impressively, even when given the captaincy, Vermeulen still managed to maintain that work rate. He was promoted to leading the Stormers this season after Jean de Villiers was ruled out with injury, and he took the team with him on his high. "Ninety per cent of captaining is if you are performing well yourself, then it helps the team," Teichmann, himself a captain, said. "It's a good that Duane has not allowed the captaincy to change his character." In fact, it has so enhanced Vermeulen's reputation that he is being talked about as a possible Springboks captain. De Villiers remains hopeful of playing in the World Cup, but there will be a curtailed Rugby Championship before that and the Springboks may need a stand-in skipper. That's a position Teichmann held for 39 Tests, and he knows the pressures of intimately. "A lot depends on the relationship with the coach," Teichmann said. Teichmann, himself, was spurned by Nick Mallett, and he indicated that Vermeulen would be promoted only if Heyneke Meyer wanted it. But there are also other considerations. "There's a big difference between captaining at Super Rugby and international level. At Super Rugby you've got the expectation of your team's fans; but with the Springboks, you have got the whole of South Africa and maybe even more people on your back. If Duane continues on that form, he may be an option but we'll have to see." There's still some time for the national selectors to make that call. Enough for us all to take a breath and have a drink, and for Vermeulen to win a few more matches for the Stormers.